This easy to apply foam sprays on to the slide out rubber seals, wipers and dust seals on the sides, top and bottom of the slide out box. It provided superior lubrication and UV protection, sheds water and is an anti-static film that keeps the seals supple for months. It also is excellent for the seals around storage compartment bin and entry doors. This Product can only be shipped within Canada. 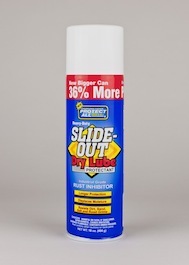 This lubricant comes out of the aircraft industry and works wonders on RV slide out tracks. 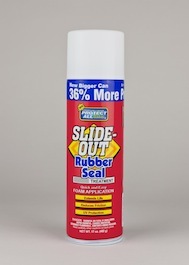 It is applied directly to the geared tracks on slide-outs, leaving a dry non-stick surface that provides superior rust protection and lubrication without attracting dirt. (not for use on hydraulic ram equipped slide-outs). This Product can only be shipped within Canada.